Barbara Frederickson of University of North Carolina posits that negative emotions aid human survival by narrowing and limiting people’s perceived range of possible actions, whereas positive emotions enhance survival by “broadening and building” options for action. Her lab’s findings suggest that positive thinking expands awareness and perception of the surrounding world, so can lead to innovative solutions to problems. She suggests intentionally implementing a “broaden-and-build” approach to emulate this expanded view: Choose a degree of focus and perspective depending on requirements. For example, to garner more clout in a discussion, she suggests involving more people who will provide support. Rosabeth Moss Kanter of Harvard Business School referred this perceptual shift as “zooming in” and “zooming out”, depending on the perspective requires. than those with a bleaker outlook. Fredrickson’s research implies that positive emotions can mitigate the cardiovascular effects of negative emotions and stress. In these activated conditions, people generally have increased heart rate, higher blood sugar, greater immunosuppression. These conditions tax physical systems and can lead to life-threatening illnesses like coronary disease. 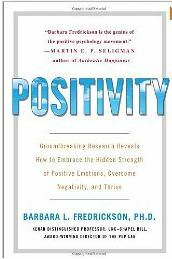 To mitigate these negative health consequences, Fredrickson recommends observing positive emotional experiences of joy, gratitude, serenity, interest, hope, pride, amusement, inspiration, awe, and love. Besides noticing these experiences, she advocates writing and meditating about these to increase grateful awareness. Dispute negative thoughts and replace them with more positive, realistic thoughts. 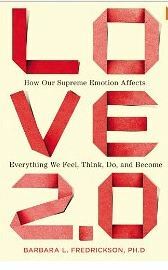 Frederickson extends her research agenda on positive emotions in her latest book, Love 2.0: How Our Supreme Emotion Affects Everything We Feel, Think, Do, and Become. She broadens the concept of love to suggest that love – or an intense connection – occurs when people share positive emotion. This lead to alignment between people’s biochemistries, particularly the release of oxytocin and vagal nerve functioning. She argues that love “literally changes your mind. It expands your awareness of your surroundings, even your sense of self. The boundaries between you and not-you – what lies beyond your skin – relax and become more permeable. Fredrickson argues that this intense connection requires physical presence, and cannot be replaced by existing digital media — reinforcing her recommendation to invest in relationships with others. -*What practices enable you to cultivate and sustain positive emotions? This entry was posted in Behavior Change, Neuroscience, Resilience and tagged Barbara Frederickson, Emotion, health, Innovation, love, meditation, mood, negative emotions, optimism, Oxytocin, Perspective, positive emotions, positivity, Problem-Solving, Rosabeth Moss Kanter, self-management, self-observation, stress, vagal nerve, zooming on February 25, 2013 by kathrynwelds.